Mom, with the help of my Dad, who did the technical heavy lifting, was also a pioneer of ebook self-publishing. They made her out-of-print backlist titles available in the Amazon Kindle and B&N Nook stores almost as soon as each opened for business. Since Dad’s death a couple of years ago, we here at Sherprog have taken over ebook formatting for her, cleaning up and standardizing book contents, creating new cover images, and expanding her distribution to Google Play and iBooks. Now, with the technical and creative assistance of my colleague Bret Norwood, we’re moving up another notch on the evolutionary scale. 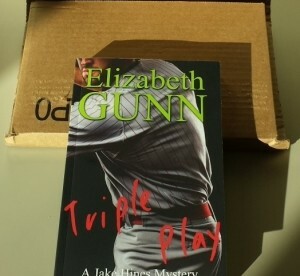 Mom’s very first novel, Triple Play , will soon be available on Amazon or in a local book store near you, as a paperback. We’re racing to have copies available for her to sell at the big Tucson Festival of Books in mid March. Bret designed the book cover and did all the finicky sizing, formatting, and checking, checking, checking it takes to turn a ‘finished’ manuscript into the camera ready copy CreateSpace demands. The first review copy arrived here earlier this week and it was a thrill to hold it in my hands. We’ve got a bit of line-by-line checking to do to ensure we’ve got as faithful a copy of the original hardcover as we can manage*. But right now it looks like we’ll make our deadline! *Back in the dark ages of 1997, when Triple Play first came out, the author didn’t get back any electronic copies of publisher’s edits, so we started from the original (Lotus Ami Pro!) manuscript she had on file and re-applied the publisher’s edits one by one. Bret really deserves a medal for this one.